The British Grand Prix always feels like the halfway point in the season, a circuit which lays bare the current pecking order and sets the tone for the remainder of the year. It has often been the scene of great controversy as well as fond memories. Sunday proved no different, providing a microcosm of all that's good and not-so-good about the sport. Attending a Grand Prix is not cheap. Therefore, it is always disappointing for fans at the circuit when the start of a race and the hustle of the opening laps are abandoned in favour of the safety car. Unfortunately this is becoming all too frequent in modern day Formula One. Although Pirelli provide teams with a wet weather tyre, these seem to appear more for demonstration than to be driven in anger. Yes there was plenty of standing water in parts before the lights went out on Sunday, but it was evident after only a handful of laps that the drivers were ready to go racing and that the cross over between wets and intermediates was already starting. Instead, the safety car over stayed its welcome and deprived us all of a chance to see the 'great leveller' bring out the best in the field. The fact that around half the pilots pitted for new tyres immediately after the green flag said it all, with the rest following suit a lap or two later. It would be inappropriate to suggest race control acted hastily in its decision on Sunday. 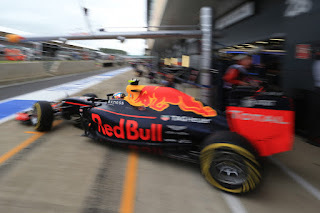 Given the downpour which engulfed large parts of the Silverstone circuit with minutes to go, they opted for what they believed was the safest option - especially in light of the tragic events which occurred in Japan 2014. 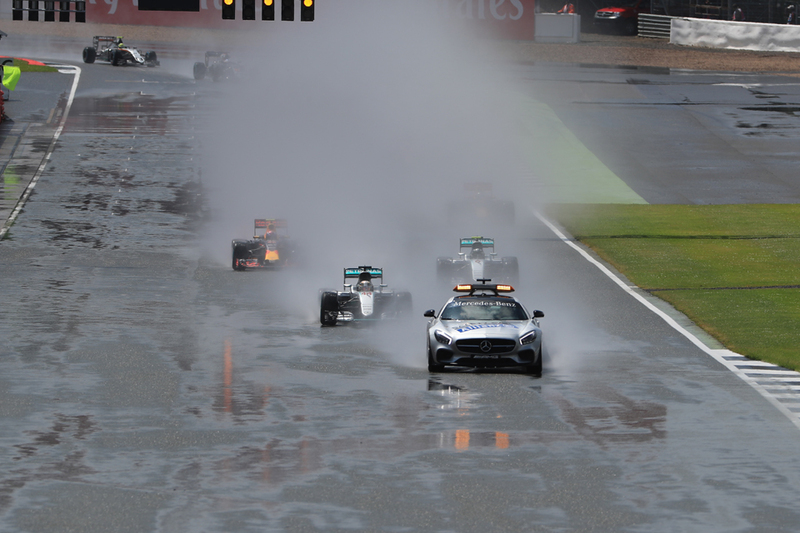 What is unclear however is why the safety car was deemed the only option in this scenario? 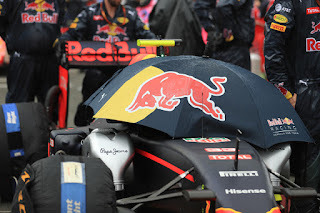 Even without the sport's fancy weather systems, it was clear that the rain was abating and would not be a prolonged feature of the Grand Prix. Therefore, one must question why race control did not opt to postpone the start to allow conditions to improve, pacifying the challenge for drivers but reducing the potential of risk? For one the sporting regulations are quite ambiguous on this area, and do provide the race director with a level of flexibility. Might a delayed start have been a better option? However, their hands are tied by the other rules which condition current Formula One. As Gary Anderson points out, cars cannot be changed after qualifying barring cooling, removing the ability of engineers to address the challenges of a wet track through alterations in areas such as ride height and downforce. Had such changes been possible then a full start procedure may well have been on the table, delay or not. Therefore, using the safety car was deemed to be the only method to ensure care and limit the weather eliminating large parts of the field in one go. Sadly this trend shows no sign of changing anytime soon, depriving drivers the chance to earn their retainer in challenging circumstances. While the FIA continues to be increasingly cautious in some aspects of race direction, it remains more radical in others. As far back as 2014 the regulator announced moves to clamp down on team radio transmissions, with the view of handing the initiative back to the driver. Ahead of the Australian Grand Prix this was finalised meaning that drivers and race engineers could only discuss issues relating to safety, developing technical failures and limited strategy. 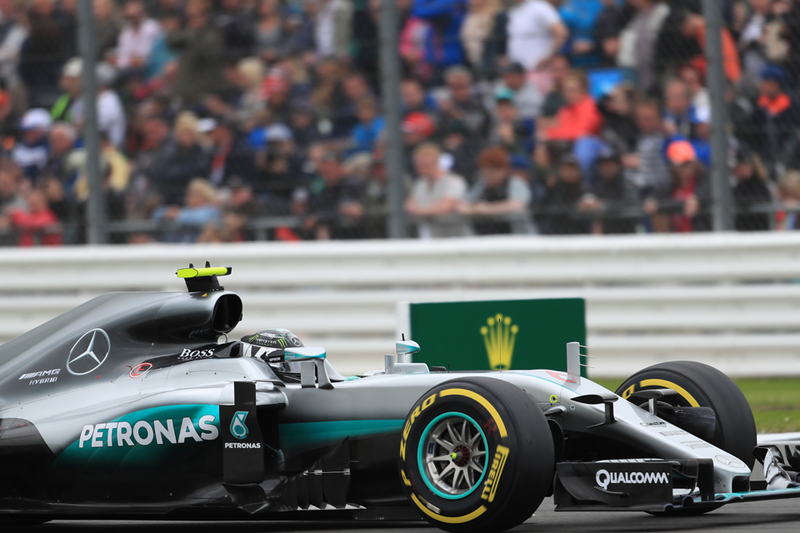 The move has been divisive, coming to a head at Silverstone with the demotion of Nico Rosberg from second to third - via a ten-second time penalty. While Mercedes was able to give the German instructions to alleviate a failing gearbox, stewards felt that responding to the further questions contravened regulations. Ultimately the Silver Arrows did not appeal the decision. However, this will do little to silence the debate. If anything it will only further entrench the opposing sides. Those in favour believe existing rules should be strengthened to place more emphasis on the driver. They argue that Formula One is primarily a driver's championship and that previous 'coaching' did little to allow the cream to rise to the top. The FIA is more aligned to this view and has stated that it will be stricter on radio communications going forward. Some at the very extreme, believe that the rules haven't gone far enough, calling for a complete ban on radios and reliance on pit boards. Those opposed feel that the rules are unworkable within the current world of Formula One. They argue that the dawn of the turbo era has resulted in highly sophisticated cars with most geniuses would struggle to understand. Furthermore they hold on to the notion that Formula One remains a team sport with hundreds in each team working frantically to put two challengers on track. Again, those rigidly opposed suggest that the current rules contradict many of the safety and cost-cutting initiatives championed elsewhere in the sport. Williams' Pat Symonds has even suggested that they are 'negligent', highlighting the brake failure which led to Sergio Perez's retirement in the Austrian Grand Prix as an example of where a team was powerless to prevent expensive damage to its car or risk to its driver - instead hedging its bets that the problem would not manifest itself before the chequered flag. Arguably, Force India will probably make a different call in future, given that Rosberg's penalty appears to set precedent. Either way, there does appear to be a degree of vagueness with regards to how the ban has been interpreted. Regardless of the reasoning behind the regulations, the governing body has not gone far enough to clarify which messages are acceptable and this will have to be ironed out should it wish to clamp down further. At the same time, unless they can negotiate a change of direction, teams will have to adhere to the regulations or face punishment. This will provide an interesting subplot for races, placing constructors in a quandary should a driver have a developing problem but be in a position which is key to either championship. Of course the matters above make up only part of the wider situation that the sport currently finds itself in. One where it faces a crisis of identity in a changing world - where advertising is down, pay-tv is on the increase and other motor racing series are beginning to catch the eye. Even before discussions began on the new 2017 regulations, it was clear there would be a large number of supporters and dissenters, stemming from where they feel the sport should position itself moving forward. Ultimately Formula One has always striven for compromise, but with falling viewership, a changing way in which people access content and the rise in popularity of series such as the World Endurance Championship, this middle ground is frayed like never before. Ultimately, future rule making lies on whether the sport sees itself mainly for entertainment or innovation. Does it focus solely on providing entertainment where variables are a must; overtaking is frequent and cars are more simplistic (increasing the use of the likes of variable tyre wear and artificial aids etc.) or does it exist to solely innovative - where rules are open to interpretation and cars are more advanced? The former would push the sport more towards the fair-weather fan, while the latter would allow teams to position the sport entirely towards developing and showcasing new technologies for the automotive world. Both have their pros and cons. Clearly there is room for both, but one must prevail as the leading motivator behind future changes if the sport is to stop inflicting internal damage. Eventually one faction will have to succeed to prevent Grand Prix racing sleepwalking away from relevance, ensuring that it becomes innovatively entertaining or provides entertaining innovation. One thing that must never change, however, is the focus on drivers. They are often the main draw for all fans and their actions often are the catalysts behind the headlines. Drivers will always push the envelope and last weekend was no different with track limits remaining a bone of contention at Silverstone. After the debate around kerbs in Austria, stewards were under extra pressure to clamp down on drivers looking for any advantage, a move which culminated in qualifying. Although not without its problems (it was initially unclear which corners were under surveillance and not all indiscretions were punished) the move was widely welcomed and hopefully set a precedent for future weekends - albeit with all corners monitored. If tarmac run off areas are here to stay then a method must be found to deter drivers from gaining an advantage. With the introduction of vast quantities of tyres, sleeping policemen or other artificial deterrents off the table, more must be done through the use of visual technology, GPS and track officials - allowing stewards to take a no-nonsense approach. So expect more of the same from stewards in Hungary, a track with an abundance of kerbs and run off areas to shorten the racing line. Very nice article Ewan; in regard to drivers going off track to gain an advantage. If we are not going to take away expansive tarmac run off areas, replacing them with grass and then gravel like in the past; maybe a solution such as very course tarmac like at Paul Ricard. Where it's safe and no-one will get beached; but vastly increases tire wear, punishment will be having to make an additional stop and/or losing tire performance.